The Thompson 6000 Series Mixer Mincers are heavy duty industrial machines designed specifically for large volume mixing and mincing. Built to Thompson's high standards of construction and finish, the 6000 Series delivers high performance and reliability consistently. Thompson Mixer Mincers are used extensively in many high production facilities. 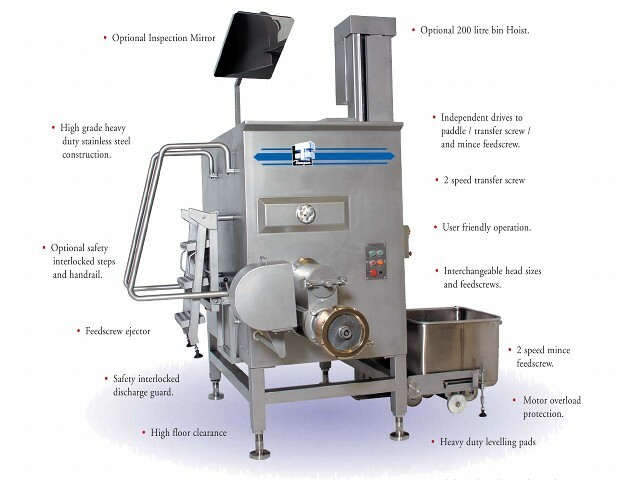 The 6000 Series Mixer Mincers have the capacity to mince fresh meat, frozen meat (40 mm cubed or flaked at -10° Celsius) and other various products. 6000-8000 kg/hr (100-130 kg/min) Primary Cut through 10 mm Hole Plate. 3600-5400 kg/hr (60-90 kg/min) Secondary Cut through 3 mm Hole Plate. The 6000 Series Mixer Mincer Cutting Systems are driven by high-performance motors through independent helical reduction gear units. The motor size is determined by the model and the customer product processing requirements, they may vary from 22 kW 2 Speed to 37 kW inverter driven options. The combination of an exceptional paddle design, multi-directional bowl transfer screw and separate mincing feedscrew delivers tremendous versatility of mixing and mincing capabilities to suit many applications. The Thompson designed ribbon paddle blades and mixing system ensure multi-directional particle movement on every rotation, maximises product displacement throughout the bowl which in turn guarantees continual product amalgamation and separation resulting in an expedient homogeneous finished blend. This efficient agitation can proficiently maintain product of clean cut particle definition or provide the heavy duty kneading action on tighter consistencies such as kebabs. The Thompson 6000 Series offers several models ranging from 200 kg to 400 kg batch capacity in single paddle design and 600 kg to 2000 kg in twin paddle design. The range is available with various mixing paddle options, drive sizes, cutting systems and exterior features of operation and control. Single or twin shaft configuration of the paddles thoroughly mixes the product in all areas of the bowl. Smart bowl design. The shape and volume ensures an efficient mix and product discharge. The efficient paddle design ensures mixing cycles and temperature increases are kept to a minimum. Strong ribbon style mixing paddle. During the mix cycle the transfer screw operates in reverse displacing product from the transfer screw channel ensuring the batch is thoroughly blended. Multi-directional product movement on every rotation maximises particle displacement throughout the bowl. Following the mix cycle a very homogeneous blend is then transferred forward to the grinding feedscrew and cutting system. Two feedscrews in all 6000 models. Interchangeable Mincing Heads Sizes and Cutting Systems 152, 160, 220 & 280 mm (6", 8 5/8" & 11") plate sizes. Single or double cut options available. Interchangeable Mincing Feedscrew diameters, i.e. 130 and 170mm. Three (3) Independent Gear Motor Drives for mincing feedscrew, mixing paddle & transfer feedscrew. Mince Gear Motors options available up to 37 kW. Variable Speed Drives (VSD) are available for frozen product applications to maintain highest production outputs possible. In these high torque situations Thompson recommend an inverter upgrade from the standard 2 speed machine. This VSD upgrade can provide Infinite Speed Control or our recommended 4 Speed Control at determined and pre-set speeds that will offer Maximum Production Outputs for customer specific products at various frozen product temperatures. With this VSD upgrade the Thompson 6000 Series Mixer Mincer is capable of Mincing a Range of Frozen Product through a 3 mm hole plate. Variable Speed Transfer Screw delivers a constant supply of product to the mince feedscrew, yet limiting over working, pressurisation or temperature increase to the product. 2-Speed Mince Feedscrew to meet the demand of mincing delicate or hard product. Clean Cut with high particle definition.